HER ART is her way to experience the pleasure and fulfilment that comes with the positive creation concept of colors, textures, techniques and evolution of form from its start to end. This dedicated homemaker of a banker found peace of mind and her heart rooted in art while keeping a watchful eye on her children who constantly dote on her. 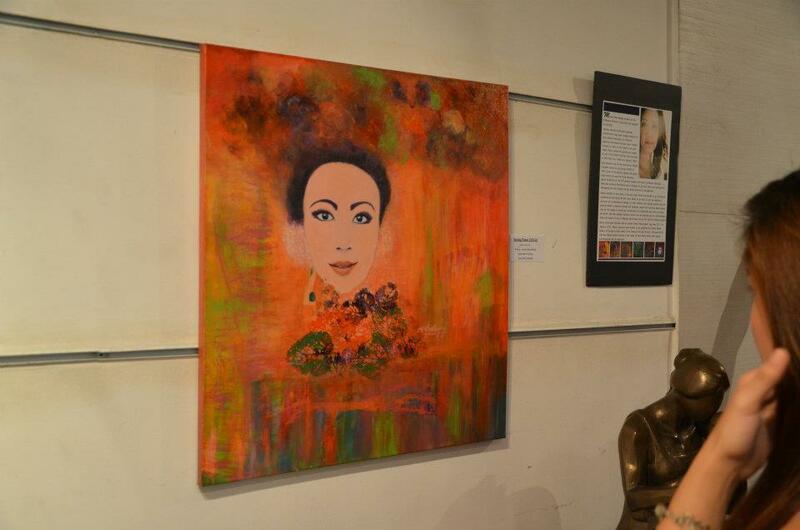 She is presently the founding member and treasurer of UWAAP (United Women’s Art Association of the Philippines). Her challenging health that she suffered while she was a student and the sacrifices of her art career and being a mother to two kids may have been a cross that she had to bear all these years but she stands firm and is happy with her footing. She is a veteran of painting circles, and has joined many art exhibits. She also sits as a judge and mentor to different workshops and painting competitions. She has showcased her works in numerous venues and sold pieces that made it internationally. You are a veteran already in the visual arts circle. You sound like a lucky lady surviving all those years with art alone. How has it been for you? Describe your saga and triumphs in the pursuit of this passion you have carved as a sideline career, being a full-time mother and wife. Oh, seems like a veteran to be there by just doing and loving what I created, creating, allowing the viewers, and time to tell na lang. Lucky? Blessed enough with what I’ve been through had no shortcuts; then, I turned my mindset creatively and enjoyed my early days in FINE ARTS that I majored in Painting at PWU, which challenged me to do better each day just to prove to my late beloved father my choice has made me happier and there’s really life in Art. But my health suffered sa kapupuyat (for staying up late). Got sick due to kung sa sipag at tiyaga (patience and hard work) with my artworks since I never say no to it. That is only when I slowed down because of my health. I learned a lot in the school of art, with schoolmates who turned buddies, professors, different people, from the vendors, janitors – kasi (because) we need them for our plate subjects. Reaching out to the masa, kasama ‘yan sa sining or else kulang ang pagiging isang tunay na pagiging artist (working with art aren’t complete if you don’t deal with the masses). ‘Yan, I learned (that), and deeper pa. When I won the grand prize at the Folk Arts experience in 1980 and others, I felt the beauty of victory, na para bang mag-(that even if I) hybernated man ako, mayroon akong babalikan, itutuloy at iiwanang mabuting legacy sa kids ko, naging students, sa young generations, mapulutan man lang ng inspirasyon sa simpleng buhay sining aking nakayanan. (I will have something to return to and leave a legacy for my children and to all my students). I was still single and a student when everything then was so easy at home even with the absence of my mother, my late father’s heroic supportiveness to me made me enjoy my art journey further. Married life made me understand fully my stand to my commitment at home as a wife, and as a mom. I asked myself: What if I can’t find a trustworthy house helper anymore to assist me with house chores, etc.? Will I quit being married or go on with life, but then again I told myself NO to selfishness momentarily. My decision to be a hands-on-mom and ever supportive wife-partner to my one and only hubby will go on with God’s grace. I made diskarte then that ART won’t leave my system. I do summer art workshops at different schools, home studios, galleries, at church and for our community. There’s decent life with art. Whatever happened then, I survived with realistic adjustment in life and willingness to stand up for every failure. The creativity turned out to be very productive in my life. You mentioned that you offered an entire exhibit to the Lord. Are you a pastor’s wife? How old are your kids now? Are they also into art? How does your husband support your craft? “Thou ART in Me” was titled that way, not because I’m a pastor’s daughter or wife, DAHIL (because) it’s my way of gratefulness, THANKSGIVING to our GOD; The Giver, Blessor of everything. It’s my way of paying forward for the gifts and talent entrusted to us, so it’s fine with me having it sold, reserved or no sale at all. It’s alright with me. I’m blessed with two children: my eldest is 25 – Hannah, who is a registered Interior Designer and part-time faculty at CSB. While David, my youngest is 21, is still in school finishing Multi-Media Arts. He doesn’t have many classes though because of his health condition but he’s into MMA- Multi Media Arts here in Southville. Both my children have art interest too. Both in a more techy way but they do freehand works as well. My husband is in corporate banking and officer to one of our country’s top 5 although by profession, he is a Licensed Civil-Structural Engineer. God hath been so good enough to us, even we started as family from little, and my faith in having a talent and proper education made us live simple beginnings. Yes, my hubby supports me by driving, bringing me to my workshops, exhibits, and buys me art materials when I lack budget for my art stuff. It’s optional, not by force though. He’s my number one critic too. He is very good at reading people and their actions. You teach art to poor children. You studied at PWU (Philippine Women’s University). 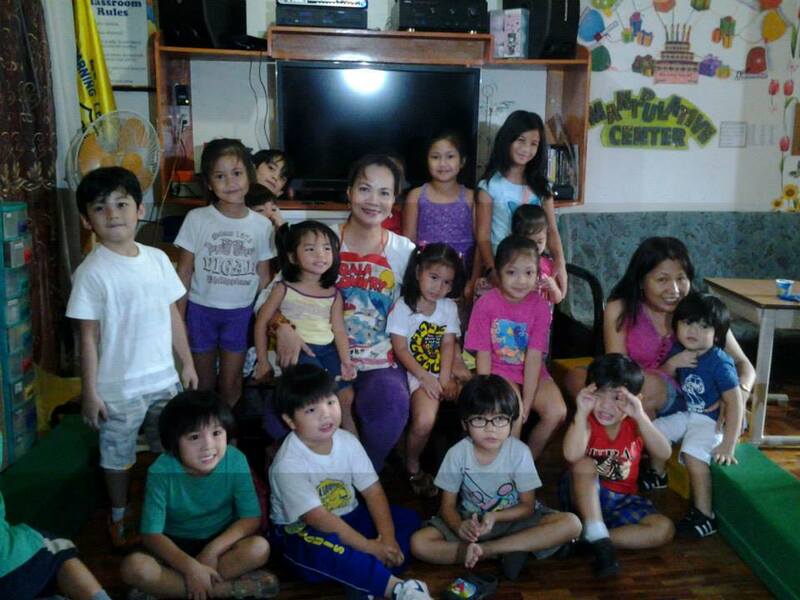 Was there a point in time that you considered to join the academe full-time as art teacher to elementary students? There are too many talented but under-privileged kids, special, or disabled kids that I teach part time as per my doctor friends requests, and part of their art therapy and advocacies. It’s more on volunteerism projects. Yes, there was a time I was a sub-art teacher at Brent School, Pasig. They hired me for full-time but I cannot sacrifice time looking after my kids and just leaving them with their nannies or house helpers. I could not leave my son because he had seizures with seasonal asthma every time the weather changes. My daughter always had sad moments when I left them after a 10 hour day. She had flu due to tonsillitis from feasting on all the sweets in the kitchen when I was gone. And she was crying the whole time while she was devouring all the candies, ice cream, chocolates and cookies that she could find. I felt so bad for my kids being home alone without me. I couldn’t afford to be working full-time teaching other kids while my own at home were having problems. I cannot trust nannies because my kids got bruised and bumps sometimes that the pediatrician advised that an adult must stay home to watch over the children. Those were the times I received many jobs invitations, even to Singapore as a children art teacher to their in progress museum and part-time visual artist way back 1995 to 2000. But family and my kids matter most over career, fame, and money. After all, it’s all worth it. No amount of money will equate my kids’ progress and quality in character. I didn’t compromise my kids and family’s welfare. I do business with Rustan’s as part-time designer and supplier. Plus, I manage a transportation business to school service where my kids then had their primary to middle, and high schools. Somehow I can watch and take care of my family with little business to help. Plus, as part-time art teacher to selected schools as my way to stay in the arts and help our family breadwinner as well. Teaching is ongoing, all year round for me. What was your first masterpiece and when did you create it? 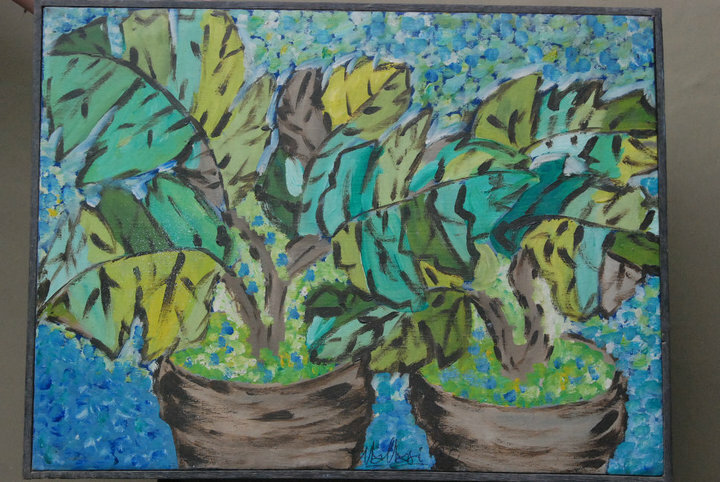 “Playtime with Greens”..18×24..Acrylic on Canvass..1980..5th of March..,30 yrs old painting..This is her gift to her late beloved Father.. Framed simply, box typed black paint by the late sir IBARRA dela Rosa, one of her mentor and professor at PWU-CMFA…Her Father and Prof/mentor has gone but this painting is still with her hanging in her workplace that serves as her inspiration to go on..
Wow, this is so sentimental. I really had an artwork titled “Masterpiece.” It’s a heavenly image, the style was so tedious but ended like a 3d effect on canvas, we had it exhibited our three-woman show – “TROIKA,” sometime 1981-1982. After our exhibit, we brought it home and somebody bought it flew with it to Canada! I’m still trying to find some saved photos of my artworks way back, hoping to find them around soon. I called, titled my serious artworks my “MASTERPIECE.” The playful ones are my plates with a heart in it too. What is your most cherished work and why? That is my daughter Hannah’s unfinished portrait when she was four to five years old, in oil and acrylic, 1995. It was my first portrait of her anticipating how she will look like when aged 18 and above. It’s still with us and she treasured it much. 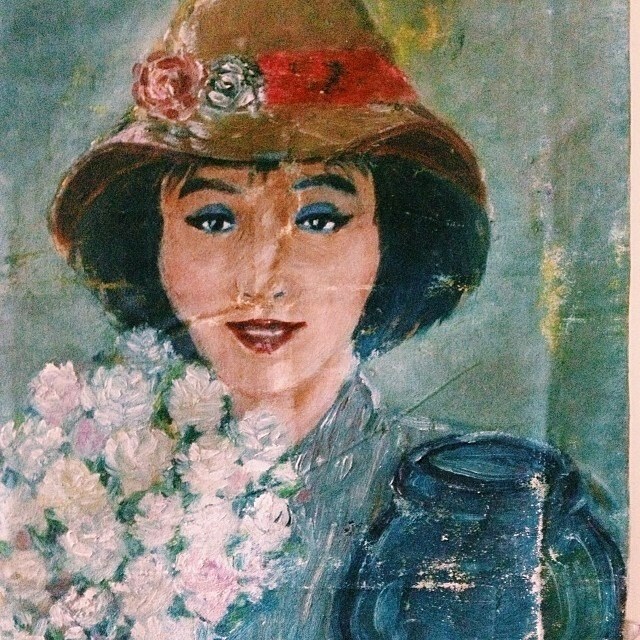 Marivel Mari-Galang 1994 Unfinished Oil Painting on canvas. Her daughter Hannah was only 5 years old. She pictured here how she’ll be as grown up. She found this hidden with her other treasured art pieces. Your paintings make it to homes in four countries. How so? Describe this entrepreneurial achievement. My early days in college were really a bigtime for me. I was lucky due to my late father’s friends’ friends, relatives who used to visit us at home. They would see my artworks all over the garage, the backyard loan, and all over the walls of our home. They will just pick and ask me when I reach home from school. They will reserve it as gifts for their homes and some flew with them to Canada, California, Vegas, Australia, and Hawaii; even around the Philippines, including Visayas and Mindanao. When I was a student artist, I only sold two pieces at a group exhibits and the prices then were low. Chamba ang benta (You sell with luck). Sometimes people will request me and order and then there are times I will just give my works away as gifts. Entrepreneurial achievement is most likely doable and workable. I survive via commission for a portrait. For my HG Interiors package, it’s like more on half mural and mural sizes selectively. I don’t paint thinking of money. I paint and create because I love it then when prospective owners buyers come, they will come even when you’re sleeping. You’ll find their messages on their requests and orders. One must learn how to save and reproduce for the next journey. When you have the right attitude, timing and vibes, even without a handler, it is possible to have decent entrepreneurial achievement by being with the right people and at the right places. What is your expertise when painting? What are your favorite subjects? I’m into Abstraction, non-rep. My favorite subject then was leaves. Using my playfulness in tech colors, I spread them around my canvas into different forms, reinventing mixtures of colors and textures, that’s how I create. Who are your influences, local and foreign when you thought of going the route of an artist, which you realized in your high school days? Influences here were my father’s nun cousin. I saw one of her oil painting – still life of a San Francisco plant. She visited us after her workshop from Amorsolo, and then I told myself, someday, I will be painting too. My father smiled at me and said – “Pang-hobby lang ‘yan anak.. Magpaturo ka sa auntie mo or mag-CCP (Cultural Center of the Philippines) ka.” (That’s only good as a hobby. Ask your aunt to teach you or enroll at CCP). I remembered what my father said from the start of my art journey till my dream came true. An artist will always be an artist. Agelessly, local masters, almost all of them: Van Gogh, Matisse, Joan Miro, and Glee inspire me. Mondays to Fridays are my regular days. Being a hands-on-mom, homemaker, little business errands, family matters, always a supportive partner to my hubby, kids, and friends like family in the art and outside. Saturdays are meant for workshops and art activities. Sunday is our Lord’s Day with family and bonding. As a part of UWAAP, an active judge and mentor at art competitions and coaching poor kids in the arts, are there any events you might want to plug? 2015 will be a fully loaded year. UWAAP will be turning ONE Year this 11th of JANUARY. There are some scheduled celebration and this to be announced soon. (Check my UWAAP post here: Filipinas all over gather for love of art at the 1st SBMA ‘Bagong Pinay’ Arts Summit). FEBRUARY 18 – I was asked to head judging the annual PDA, poster making contest nationwide for elementary levels, venue to be announced since this will be an on the spot competitions. MARCH – I am getting ready for a women’s month long invitational group exhibit by another friend. MAY – Mother & Son exhibit for Mother’s Day and followed by my 2nd SOLO Woman Art Exhibit, venue update will follow soon. Upcoming outside the country group exhibit too, almost after every two months my two art groups have exhibits scheduled. Still need to double check for the times. All images are courtesy of Marivel Mari-Galang. To contact the artist, please feel free to like her Facebook page.